Teutonic Tuesday: NEIN! KEIN FERRARI! No, I’m not mistaking this Teutonic Tuesday for a Spaghetti Sunday. This is totally German. It’s not a Ferrari Tipo F101 (365 GT4 2+2, later on named 400 and 412: the Daft Punk Ferrari). It’s a Bitter SC. Based on an Opel Senator A. It was Erich Bitter’s second attempt to create a coupé based on a big Opel. He already had produced, with lots of help from GM, the CD (Coupé Diplomat). Which was based on the, you’ve guessed it, Opel Diplomat. The design on that one was done by Frua, although it was a reworked design of a prototype that M. “Chuck” Jordan (Opel themselves) already showed 3 years earlier. But all that is for another Teutonic Tuesday, if I ever find a decent 1/43. I have to as that one is so much better than this, well, interesting SC. And that SC was for, you’ve guessed it, Senator Coupé. At least, that’s what I always thought. Another interesting fact is that it was actually sold in the USA. Several Buick dealerships sold it, often with a bigger 3848 cm³ engine (210 hp instead of the regular 180) from tuner Mantzel. Better not GIS on Mantzel in combination with Opel: you’ll be horrified. For those not capable reading German: What use would a car have to me when I go of skiing for a week and try to start it after 5 days noticing it actually won’t start at all. Therefor it amuses me a lot that in the prototyping phase a V8 was considered as well. Of course they tried one from GM (Holden). But they also tried one from... Lamborghini. The 3.5 Liter unit from the Urraco. And there was another Italian twist on this one. The finishing touch of the design was done by Giovanni Michelotti from Torino. Actual production of the bodies was done at Maggiora’s. The CD had been a full German product: the bodies were assembled at Bauer’s. When the SC was being planned however, Bauer just had gotten the order for producing the BMW M1 (after Lamborghini failing to do so). And no capacity left for Bitter. And do you recognize those taillights? 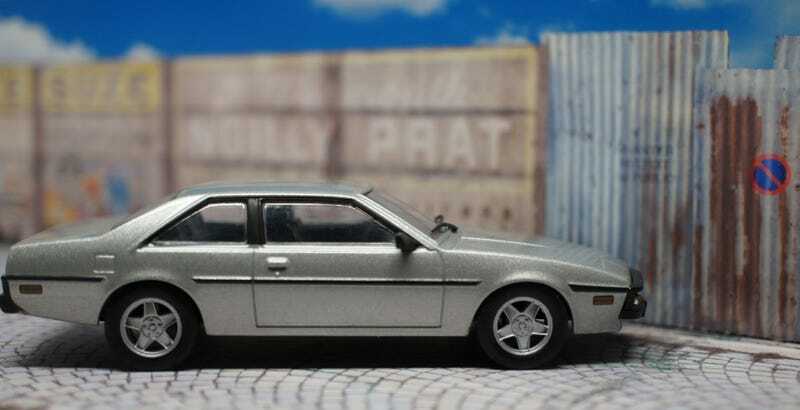 Italian as well: Lancia Beta Montecarlo (Scorpion in the US). The small blinkers/foglights in the bumper were supposed to be from the Ferrari Mondial. And the leather seats were upholstered at SALT, a Torino company. The rest was German. Really. Erich also made a convertible out of it. And a 4-door sedan. Wait. 4 door Senator Coupé actually I suppose? Way before the Mercedes CLS or the Passat CC were a thing Bitter had a 4-door coupe! Only 5 of those were build (1 of which was the prototype), 3 of which ended up in the USA. But in eight years of production (1981-1988) Bitter’s sales didn’t meet the expectations. Only 488 units were made. As the development of the 2 door coupé alone (461 units) had costed over 8 million DMark you can imagine the return on investment to be poor: 17k DMark for each sold car! Quite A lot if you know the car it was based on was for sale in Germany for about 40k DMark. The model is a 1/43 from Eagle Moss’ Opel Collection. You often see them sold as being IXO but I’d doubt IXO to have anything to do with these. IXO certainly would have gotten the wheels right: Most of these left the factory with the Opel Senator wheels still on ‘m. I have no idea what wheels they’re trying to replicate here. I’m not a big fan of this diecast model, it was a catch I got with some other models I was actually looking for. There’s a NEO 1/43 of this as well: If I ever run into that one for a decent price I’ll consider it. But not before I get me that Bitter CD. And that’s it for this week. Next week I think I’ll try to start with the Le Mans prologue, we’re finally heading for the biggest even of the year!!! !